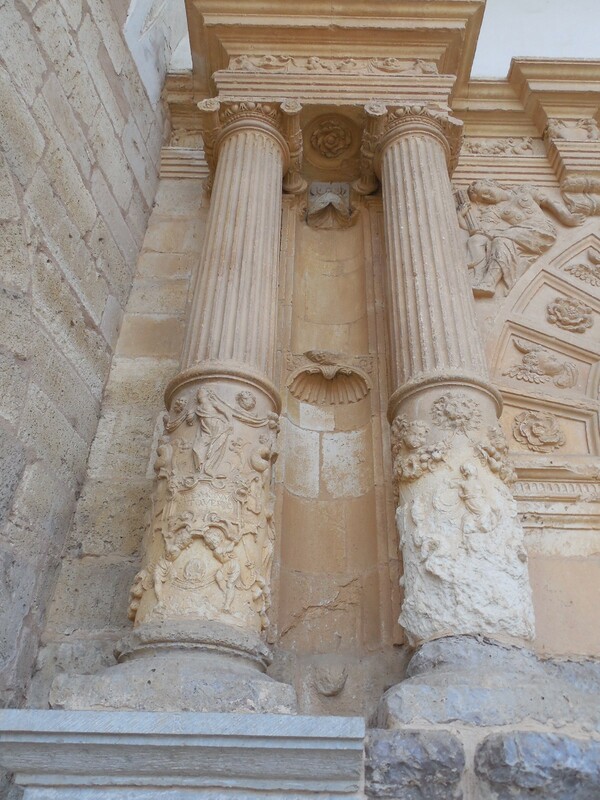 My last post, “Beyond Burgos,” was sent in a state of extreme crankiness. The day had not started well. We left the ancient village of Castrojerez, capped off with a 9th century castillo, and climbed a 12 percent grade prior to fueling up on coffee. 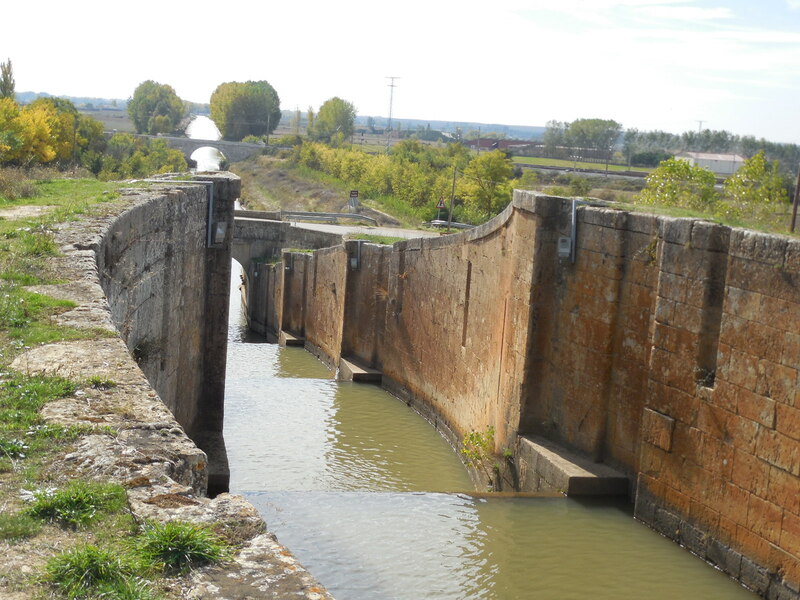 Landscape-wise and energy-wise the day was flat – relieved only by the lovely Canal Pisuerga built in the 17th century. It is interesting that the regional government is considering the installation of 50 locks – a conversion from today’s recreational use to yesterday’s commercial use. We ended our day at Fromista – famous for its 11th century church, Iglesia de San Martin, consecrated in 1066 and reputedly the/one of the/ best examples of Romanesque architecture in Spain. I really wanted to see the inside. Mass was at eight o’clock. But I was trying to blog “Beyond Burgos,” and things were not going well. The post itself had been written for a good hour, but my Samsung Tablet has a mind of its own. Formatting the blog on an eight-inch Tablet is always difficult… sometimes a nightmare. This particular post was driving me crazy because I had my eye on the clock. The text and pictures would look OK; I would “save”; but when I would check “preview,” the paragraphing had disappeared. Again and again I tried to correct the formatting. Meanwhile the clock was ticking closer and closer to eight. I missed mass, and I posted the blog in a surly mood. Our constant companion, John Brierley, (author of Camino de Santiago) had warned us that walking El Camino in the fall had a downside in that villagers, who had been swamped with foreigners for the previous four months, had had enough. Enough of litter, drinking, and frustrations inherent in pilgrims expecting you, the Spaniard, to speak their language. I can most certainly empathize with the native population, but I am still sensitive to perceived slights. I think Americans are received less well than other pilgrims. The number of American pilgrims has increased dramatically since the screening of The Way with Martin Sheen. The good news is the boom in tourism; the bad news is the boom in tourism. I felt Fromista to be unwelcoming. The woman in the bakery did not respond to my greeting and several people crowded in front of me at the checkout. 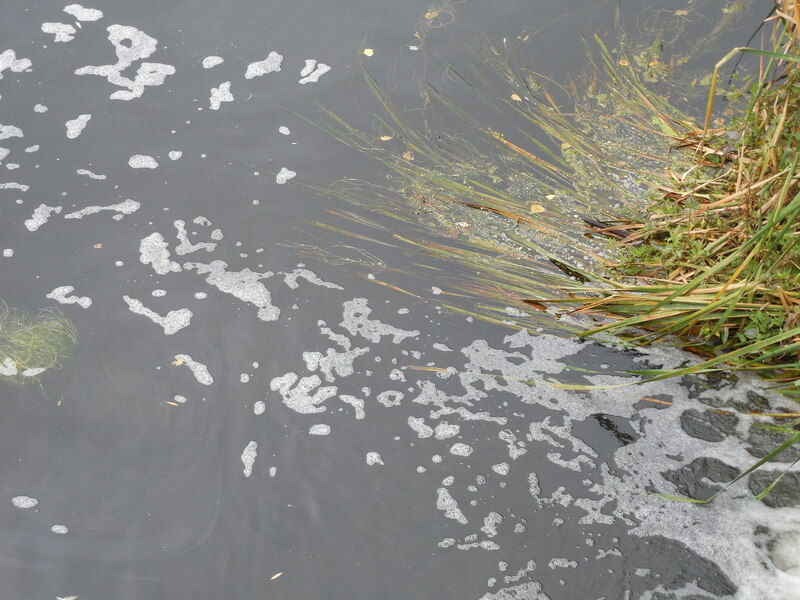 All in all, aside from walking along the river and seeing the canal, the day was a downer. But then came the following day, and leaving our pension at dawn, I marveled at the shadow thrown against the side of the Romanesque church. 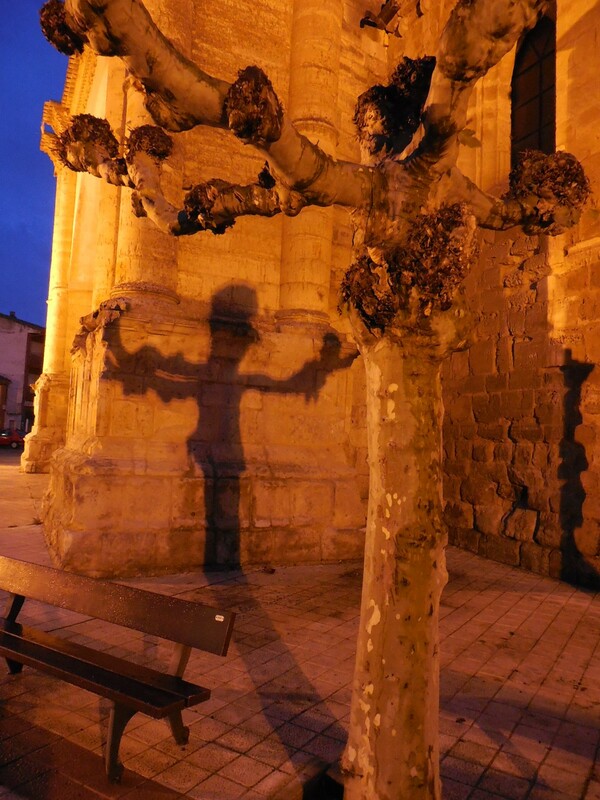 The street light behind one of the pruned Plane trees had projected a crucifix on the honeyed stone. What an unexpected delight. And the day only got better. 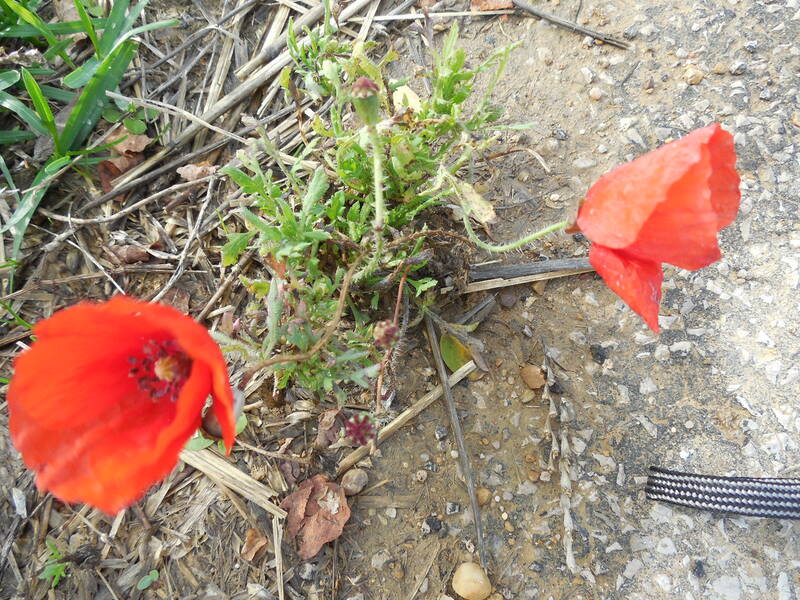 I saw two improbable poppies, and later in the day, I saw a huge bed of yellow crocus. Later, dark, rain-laden clouds raced across the sky as though they were a product of time-lapse photography. But the highlight of the day was meeting an elderly man at a crossroads. Someone said that he was the mayor of the nearby village, population 60. Maybe. He was handing out hard candies and writing short blessings in our pilgrim passports. I can’t say how these not-so-small things lifted my spirit. Seemingly the world’s biggest bread basket. As a pilgrim walking the way, I am supposed to be learning lessons. Thus far I have learned that every downhill is followed by an uphill. I have learned to not look too far ahead: it is best to keep my head down and just keep on going. And I have learned to take pleasure in small things. When you walk The Camino, having a BMW at home is a lot less important than having sufficient hot water at the end of the day. I am learning to center and go with the flow. 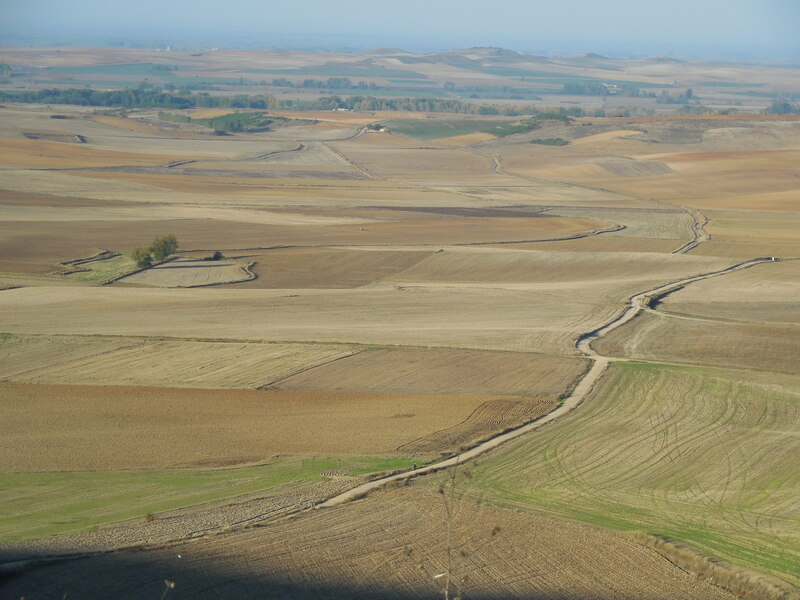 This entry was posted in Uncategorized and tagged "The Way", Canal Pisuerga, Castrojerez, El Camino de Santiago, Fromista, Martin Sheen, Spain, Walking The Way. Bookmark the permalink. I love your blog posts Doris and am SO PROUD of you! Dear Sherry, Thank you for reading. If you weren’t so busy writing and publishing, you could walk The Camino too! I am a bit surprised that you say you are just now learning how “to go with the flow”. In my mind you are and have always been THE QUEEN OF GO WITH THE FLOW. 🙂 Loved the crucifix. Love you. I’m thinking that healthy feet (something I had always taken for granted) might top the list. And hot water would be a bonus. 20 miles yesterday, and non-stop driving rain and wind the day before. Today a serious 20-mile up and down. It is hard to say whether the ups or downs are worse. Gotta go. Thanks for keeping me company.